What do you want for your little one? Happiness? Health? Confidence? Skills that will last a lifetime? We wanted to give our youngest students a program that would encourage all of these things while letting them do what they love most: have fun! That’s why we created the Ally Ballerina™ program. The program is designed to give growing children the very best foundation in dance, movement and music while building skills that will serve them throughout their lives. It’s based on the fundamental truth that children learn through their play. In the Ally Ballerina program, children have fun hearing stories, dancing, playing music, discovering with mom and using their imagination. With the help of child psychologists, early childhood education experts, and experienced dance teachers, we created a curriculum based on science and experience. 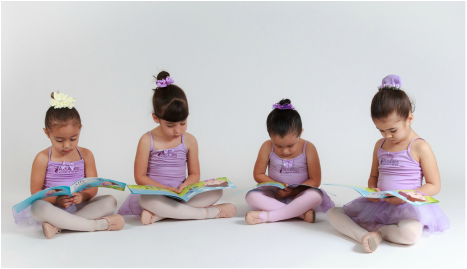 With Ally Ballerina, you can be sure your child is learning in a safe, nurturing, and structured environment. GREAT NEWS! As Ally Ballerina continues to grow we are happy to announce the new additions to our Program: Dancing-With-Mom classes and music lessons for our munchkins 0 to 3 years old!